In our ranch-style house in Greenville where I was born, the wood-paneled kitchen was where everyone wanted to be in the evenings. Our dining room functioned as my mom’s sewing room for her sewing and alterations business, so we ate dinner at the kitchen table that sat just inches away from the avocado green refrigerator. When my little brother was a baby, he got his baths in the kitchen sink, and after dinner, the table was covered with puzzles, board games and homework. For a rare treat, my parents would pull the TV with its bunny ears antenna into the kitchen, if a Disney special like Chitty Chitty Bang Bang or The Journey of Natty Gann (which might have been the first movie of John Cusack that I ever saw and loved, and the thought of jumping a train and traveling like a hobo with him seemed pretty romantic…) was playing during dinner. But most nights, there was no TV during dinner, and of course, no texting, no tweeting, no Angry Birds, or anything else like that (although our parents did have to pry books out of our hands when we tried to bring those to the dinner table). We sat and ate dinner and talked and laughed - just how I want dinner to be with my own kids someday. The laminate-covered counter that backed up to the couch is the place I remember my brother, sister and I gathering around when my mom was cooking or baking. 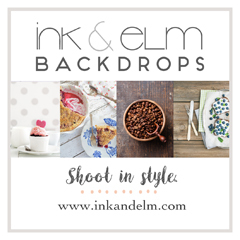 Every family dinner, birthday cake, batch of cookies and holiday pie was prepared at that counter, with us standing on stools or the tips of our toes, our noses pressed against the edge of the counter, trying not to miss out on a single drop of cake batter, spoonful of cookie dough or smear of frosting. We’d argue over who got to lick the bowl, beaters and spatula, as though we thought we would never have another chance, even though there was likely to be another dessert in a week or two. But to the mind of a child, that’s the same as waiting forever. If I was really lucky, my mom would let me have all the leftover scraps of pie dough after she finished making pies, to shape into my own little mini pie. I would play with the dough until it was completely tough and overworked, and then fill it with jam to bake alongside her pie. I learned early on that cake batter was delicious, but muffin and pancake batter… not so much. I’m still not sure why that is. We ate spoonful after spoonful of raw cookie dough (with no regard for raw eggs), but a tiny taste of raw pie dough was more than enough. It seems that no matter how grown up we get, we never lose that child-like love of cookie dough – maybe because almost all of us, every once in a while, wish we were kids again, back in the kitchen helping mom, with no worries of bills, health insurance, jobs, commutes and all that other grown-up stuff that’s not nearly as fun as baking cookies. 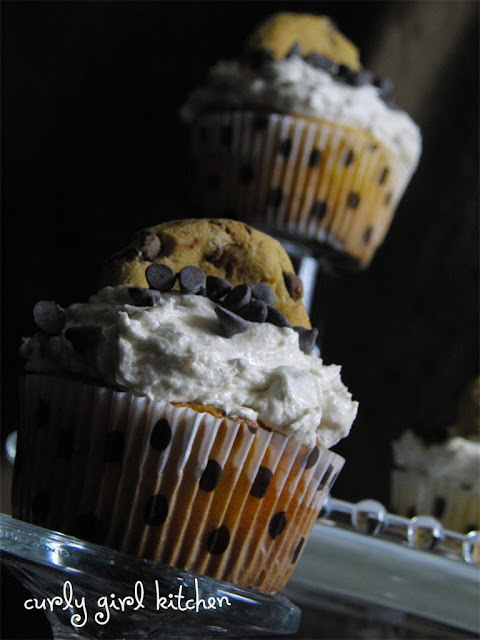 So after a friend mentioned a to-die-for cookie dough cupcake she’d eaten from a local bakery, it became my personal mission to create a signature version of my own. 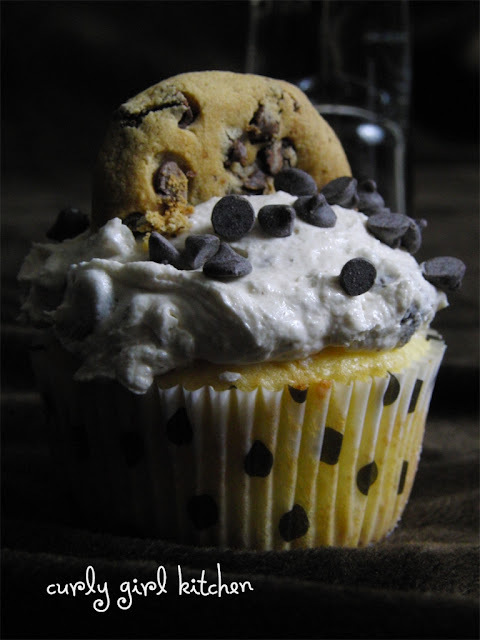 Now, I’ve never tasted the cookie dough cupcake from that bakery, or any bakery for that matter, so I just gave a lot of thought to what I would like in this cupcake. I’ll admit, I’m a sucker for the Chips Ahoy Chewy Chocolate Chip Cookies – as much as I love homemade cookies, these are my favorite store-bought cookie. They’re just so soft, so perfectly barely baked – so I knew that I wanted to incorporate these into my cupcakes in some way. I know, I know, I could/should/would have baked my own cookies before-hand (if I hadn’t already baked two birthday cakes plus a batch of cake pops that weekend), and you certainly can if you like. Or just do it the easy way, because it’s just as yummy. And coincidentally, these little cookies fit perfectly in the bottom of a cupcake liner, which is exactly what I wanted them for. 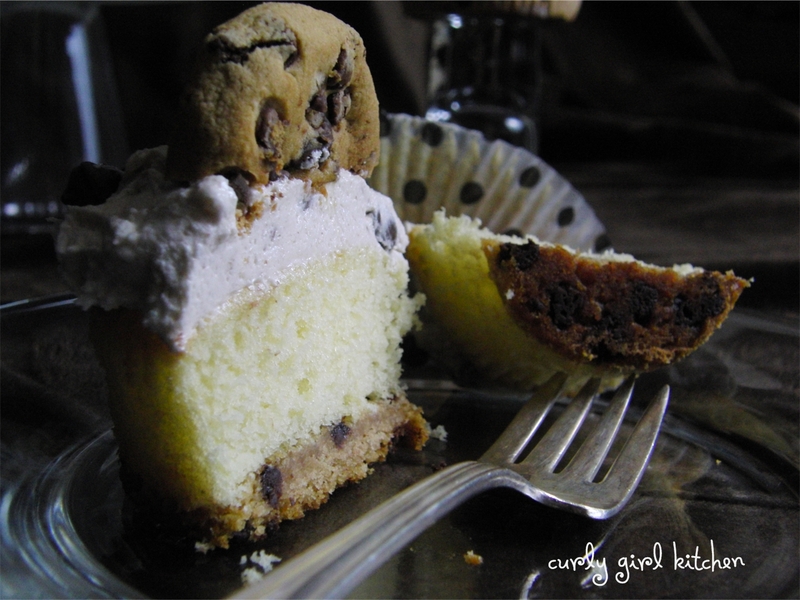 Who could resist a cupcake baked on top of a cookie? Yellow butter cake tastes rich and delicious, without competing for attention with the cookie or the frosting – and since the frosting is the most important part of this cookie, it should be the star. I considered mixing chocolate chips into the cake batter, too, and as amazing as that would be, I decided against it (more due to the fact that I didn’t have enough chocolate chips for both the cake and the frosting than for the fear of chocolate chip overkill, if such a thing even exists). So, for the part I know you’re waiting for: The Frosting. 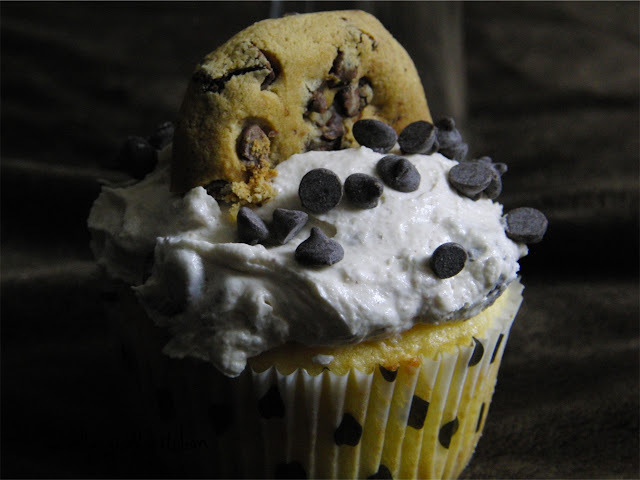 The frosting was my cookie dough element in this cupcake, although I didn’t want to just place a scoop of cookie dough on top, I wanted it to be a cookie dough buttercream. I looked at the list of the ingredients that I would usually use when baking chocolate chip cookies – butter, brown and white sugar, eggs, vanilla, salt, cinnamon or nutmeg, flour, baking soda, chocolate chips and possibly nuts, my favorites being pecans. I nixed the eggs, flour, baking soda and white granulated sugar, and tweaked the ratio of butter and brown sugar, with powdered sugar instead of granulated, to make a creamy, fluffy buttercream with enough brown sugar to add that slight grittiness that is expected when you eat a spoonful of raw dough, and just the right hints of salt, vanilla and cinnamon. After whipping the buttercream until it couldn’t get any lighter, I stirred in the chocolate chips and chopped pecans. 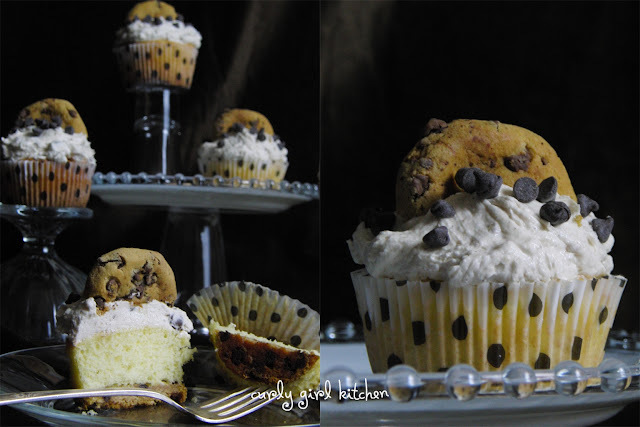 With the frosting sitting pretty on top of the cupcakes, a little sprinkling of mini chocolate chips and garnished with a half cookie, there was nothing I wanted to change. And I think my group of taste-testers would agree! Preheat the oven to 350. Line muffin pans with 30 paper liners. Place a cookie in the bottom of each liner, reserving the other 15 for later. Mix the cake mix, eggs, butter, milk and vanilla on low speed to combine, then on medium speed for 2 minutes. Spoon into the liners, on top of the cookies, filling them 2/3 full. Bake cupcakes for 18-20 minutes, until a toothpick comes out clean. Cool in the pans for 5 minutes, then transfer to wire racks and cool completely before frosting. In the bowl of a stand mixer fitted with the whisk attachment, beat the butter and brown sugar for 5 minutes on medium speed, until pale and fluffy. In a separate bowl, combine the powdered sugar, meringue powder, salt and cinnamon. Add by spoonfuls to the mixing bowl, mixing on low to combine. Add the vanilla and milk, then beat on medium high for 4-5 minutes until light and fluffy, adding more powdered sugar if it's too thin, or more milk if too thick. With a spatula, stir in the pecans and 1 cup chocolate chips. Spread the frosting over the cupcakes. Take the remaining 15 cookies and cut them in half with a sharp knife. Top each cupcake with half a cookie and the mini chocolate chips.